Welcome to Diamond Kitchen and Bath! Diamond Kitchen and Bath does it all. We are a kitchen and bathroom home center, distributer and remodeler. We are unique in that we offer one stop shopping for turnkey projects as well as a home center shopping experience. We have a large beautiful showroom. We offer FREE in-home estimates, and we can offer installation services on items purchased from our company. We have a large selection of kitchen cabinetry and an incredible array of styles, from basic to full custom to suit all budgets. We offer floor tile, backsplash tile kitchen sinks, faucets and more. 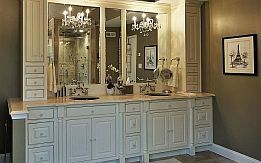 We have a huge selection of vanity and bathroom products to choose from including tubs, faucets, tile, toilets, natural stone, shower doors, cabinet hardware and accessories. We have been doing business in the Eastern Pennsylvania, Philadelphia, Bucks and Montgomery county area since 1999. Our showroom staff is comprised of highly skilled, experienced kitchen and bathroom designers and home remodeling specialists. We are here to serve you. At Diamond Kitchen and Bath our customer is not only important, but our best resource for inspiration. Diamond Kitchen and Bath offers design services that make the task of re-designing your project easy and comfortable. 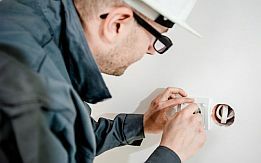 Our experienced staff will come out to your home to discuss the project, then they will measure the site and apply the ideas discussed in the home. 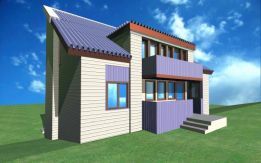 After gathering all information the designer will then create a 3d design to examine and modify to your liking. We are a full service kitchen and remodeling company. Installation as well as managing your dream kitchen or bathroom is just a part of what we do. With a commitment to quality and excellent customer service we will transform your space. 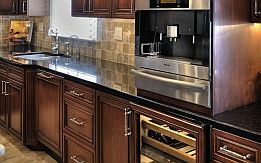 Diamond Kitchen and bath offers a wide variety of kitchen cabinet products at all price points, from basic cabinetry to fully customized products. We can meet every need at every budget. Cabinets are offered in all styles in nearly every breed of wood. Diamond Kitchen and Bath offers a wide variety of bathroom and vanity cabinet products in many styles and finishes at all price points. We can meet every need at every budget. Cabinets are offered in all types of style from traditional furniture style to wall hung contemporary. 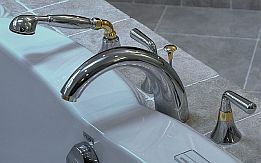 Offering a full array of faucets, plumbing fixtures and accessories for your kitchen and bath, Diamond Kitchen and bath has hundreds of faucets shower fixtures toilets, tub and more to view in our amazing showroom. Diamond Kitchen and Bath offers a variety of shower door options: pivot, sliding and custom swing doors. Depending on the project, we can find the style that works best in your bathroom. We will work with your to find the door that best fits your needs. 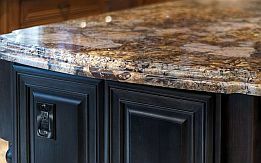 Speak with our knowledgeable staff about every kind of countertop, whether it is granite, marble or quartz, our specialists will walk you thru the process so can select the look that is best for your project. It will be both affordable and beautiful. These seemingly small fixtures can add a ton of style to your kitchen or bathroom cabinets and provide a great ability to get creative. 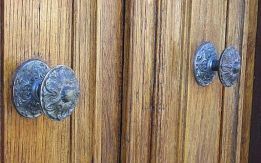 Adding hardware to a cabinet can change the overall look, making a stylized statement or simply changing the overall look. Ready to start your new kitchen or bathroom remodeling project? "Diamond has redesigned and remodeled our kitchen and 2 baths. Before I retained Diamond, I did and Dun & Bradstreet financial review of Diamond. Passed with flying colors. Diamond is far and away the best contractor I ever worked with." "No need to look any further. If you are looking for a company that is talented, reliable and stays within your budget then you should be hiring Diamond to do your project. We first had our kitchen updated and were so thrilled with the results, that we had them come back to update our master bathroom. Diamond's staff is extremely professional and attentive." 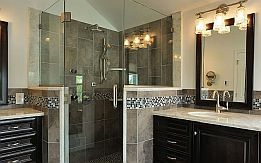 "I contacted Diamond K&B 2 years ago to renovate my master bath. I met with Nick, a designer at Diamond. He listened to my needs and proposed a design I was happy with. The end results were outstanding..."